There's been good news for fans of TV show The Matt Hatter Chronicles in the past couple of weeks, as the show's success continues to grow. New Zealand's TVNZ recently picked up the CGI HD animated boy-targeted series for its free to air commercial channel, TV2. The series is set to bow on TV2 as part of its spring line-up on the 2Kids weekend programming block in 2013. 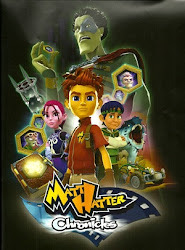 For those who don't already know, Matt Hatter Chronicles, which launched last year, is an adventure-comedy series about Matt, an ordinary boy who discovers that his family defends a gateway to a dimension called the multiverse. To save our world and the multiverse, Matt and his friends must battle and capture infamous villains from movie, myth and legend. Produced by Pinewood-based Platinum Films and Dream Mill and animated by Toronto's Arc Productions, the show uses state-of-the-art 3D animation designed to bring the story to life and to make children feel as if they are part of the action. It airs on ITV and can also be seen on Nicktoons in the UK, Teletoon (in Canada), RTE (Ireland), SABC (South Africa) and Al Jazeera's Children's Channel (Middle East). It was also recently acquired by Network Ten (Australia) for its free-to-air channel, Eleven. And why are we mentioning this? Because many of the creative team are names downthetubes readers will recognise - and there's a licensed comic based on the show on its way from Titan next year. Top of the creative mentions has to be for Transformers guru Simon Furman, who works behind the scenes as Script Supervisor, overseeing the other writers and other scripts, making sure the show is as good as it can be. He's working with Andrew Wildman again, another Transformers name and co-creator of the cowboy fantasy Frontier, who is lead concept artist on the show, overseeing work by the likes of London-based Spanish talent Ana Bermejo. If those aren't enough of a Comic Connection for you, then the upcoming launch of a Matt Hatter Chronicles magazine is. Back in July, Platinum Films announced the forthcoming publication of a range of official comic magazines based on the hit 3D CGI children’s show, which will see a series of magazines published by Titan, all featuring bespoke comic art created by the company. The core demographic for the comics, as for the television show, is boys aged 5-10. The series will start with a bumper special launching in early 2013 and will be available in both hard copy and digital editions. ITV Studios Global Entertainment is representing UK, Eire, Australia and New Zealand for consumer products merchandise, home entertainment and promotional rights for Matt Hatter Chronicles.